Washington is a gorgeous Pacific Northwest state named after one of the most iconic men in American history, George Washington. Although the state is famous for being technologically advanced and home to some of the largest and most important companies in the country (Microsoft, Amazon, Starbucks, etc), it’s interesting to note that Washington is also an awesome place for RVers, nature lovers, and adventurers. With it’s beautiful, varying weather, endless activities, and lovely scenery, this is definitely a bucket list location. Without further ado, here are the best RV trip ideas for our free Washington RV travel guide! 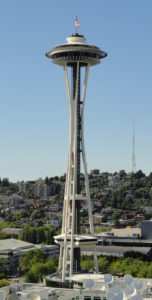 Kicking off our list is The Space Needle. This landmark is a 605-ft high observation tower that attracts millions of visitors each year. Located in the capital city of Seattle, The Space Needle offers breathtaking 360-degree views of the city’s landscape. Besides sightseeing, the needle is home to the SkyCity Restaurant. It’s closed for renovations during the time of writing, but there are plans for it to open up to the public soon! Price: General admissions is $22 for adults, $19 for seniors, and $14 for kids. Trailer Inns RV Parks of Bellevue is a solid place to stay in the area. Good Sam gives it three out of five stars with a facility rating of nine out of ten. The campground offers all of the basic amenities needed for a comfortable vacation, such as 100% full hook-ups, free cable TV, and basic Wi-Fi. Rates start at $30 per night for a single back in. Best of all, Bellevue is one of the nicest spots in the Seattle area, with lots to do. So even when you’re back from The Space Needle, you’ll be near restaurants, movie theaters, and more. 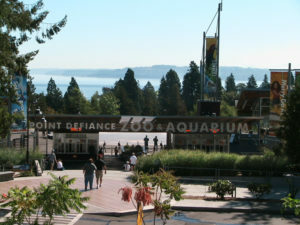 Next on our list is Point Defiance Zoo & Aquarium located in Tacoma. This zoo/aquarium is situated on 29 acres of fun and is ideal for Washington RV road trips with kids. The zoo part features animals from around the world, from tigers and porcupines to sea otters and Arctic Foxes. They conveniently place each animal in an exhibit named after its natural habitat which makes it super easy to find your way around. They offer multiple floors worth of aquariums featuring lots of colorful fish and a 24,000-gallon lagoon exhibit! Price: Tickets start at $15.95 for adults, $11.95 for kids ages 5-12, and $7.95 for kids ages 3-4. Discounts are available for seniors. About 20 minutes from Point Defiance Zoo & Aquarium is Majestic Mobile Manor RV Park. it’s a modern campground that offers Wi-Fi, allows pets, and even includes a pool. Google reviews give this park a little over three and a half stars, with rates starting at $44 according to Good Sam. if you’re in need of a Recreational Vehicle, we suggest checking out some great Washington State RV rentals around the area. Hoh Rainforest is beautiful, and one of the largest temperate rainforests in the USA. Luckily, these woods are protected from commercial exploitation, because this is a place you wouldn’t want to miss! There is abundant rainfall in the area, which makes keeps the oasis looking absolutely green and stunning. Its lush scenery and unique wildlife make visiting Hoh one of the best RV trips you can possibly take in Washington. It’s open year round so there is ample opportunity to see this bucket list worthy paradise! Price: Entrance to the National Park is $25 per vehicle, and the pass lasts for up to seven consecutive days! There are many places for RVers to stay right outside the park boundaries. Most campgrounds have spaces limited to RVs that are 21 feet or shorter, so be prepared. The park website says that rates start at $20 per night, but also says to contact the visitor’s center for more information. The center is open summer long. The Seattle Great Wheel is a giant ferris wheel located on Pier 57 in Elliot Bay. It’s a whopping 127-feet high and takes anywhere from 10 to 20 minutes (depending on crowd size) to revolve. This special activity is a must for Washington RV vacations. Everyone in the family can enjoy this breathtaking experience. 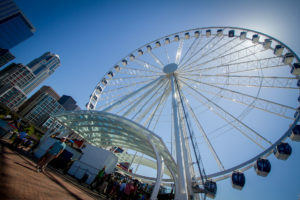 Whether young or old, the Seattle Great Wheel should definitely be on the itinerary! It’s open Monday to Sunday and it’s designed to withstand any sort of weather conditions Seattle has to offer. Price: Tickets start at $14 for adults, $9 for kids. Discounts are available for seniors. Lake Pleasant RV park is a 30-minute drive from all the main attractions in the Seattle area, including the Seattle Great Wheel. Good Sam gave the campground a 9.5-star rating, with reviewers giving it four and a half stars out of five. It’s open all year, allows pets, and has full hook-ups. According to Good Sam, rates at Lake Pleasant RV Park start at $44 per night. Find other high-quality RV parks in Washington and compare locations, prices, amenities, and more. 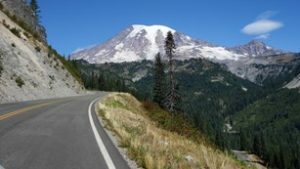 Mount Rainier National Park ascends over 14,000-feet above sea level! This iconic Washington landscape is one of the most famous and oldest national parks in the country, dating back 9,000 years and attracting millions of visitors ever since. The park is home to six major rivers and subalpine wildflower meadows that line up around the icy volcano. There are three RV campgrounds in the park. Cougar Rock, Ohanapecosh, and White River. Each park has $20 nightly rates. At Cougar Rock, motorhomes over 35 feet and trailers over 27 feet are not permitted as damage to the vehicles may occur because of the terrain. 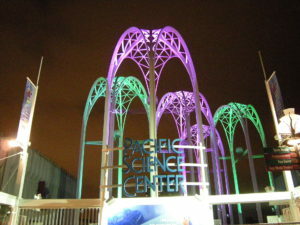 Their tagline – experience something new every day – is exactly what the Pacific Science Center is all about. This is an award-winning science center that offers weekly lectures on exciting science topics, science-based movies, and more! This facility is dedicated to igniting curiosity in every child. Although people of all ages will definitely enjoy what this science center has to offer, it’s especially important that you don’t miss this attraction if you’re going to be in Washington with kids. Price: General admission starts at $21.95 for adults and $19.95 for kids. Since this science center is located in Seattle (like a few of the other spots) you can stay in one of the Seattle based RV parks we mentioned, such as the Lake Pleasant RV Park. What’s advantageous about staying at a park like this is that you’ll have easy access to multiple attractions on our list. Remember, rates start at $44 per night. If you’re looking for the best of the best, check out our list of the best RV Parks in Washington. This non-profit museum is described as leading edge and dedicated to the ideas and risk-taking that fuel contemporary pop culture. From inside to out, it’s a true work of art. With a super-colorful, unique architecture, a monorail that takes you around the buildings, and relevant pieces located throughout, this is another must we had to add to our Washington RV trip planner. The Museum offers shows, interactive games, and more. Price: General admission is $28 for adults, $19 for kids. Discounts are available for military, students, and online purchases. The Museum of Pop Culture is yet another fantastic attraction located in the Seattle area. Eagle Tree RV is a good campground that’s located about an hour away from the Seattle city center. What we like about it is that its open year round, it’s big-rig friendly, and offers free cable TV. Rates start at only $39.85 per night, with a weekly rate of $230. They offer discounts for Good Sam members. Situated in Skykomish, Washington, is Stevens Pass Ski Area. 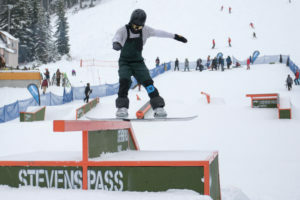 It’s a massive 1,125-acre winter sports park Stevens offers all the staple winter activities like skiing, snowboarding. They offer rentals, lessons, and more. It’s a great park for adventures. The best part is that you don’t only have to go during winter. If you’re not into the winter sports, they’re open during summer as well, where you can mountain biking, and kids can play adventure games. Price: Daily lift tickets start at $45 for adults and $40 for kids. Good news, Stevens Pass Ski Area just started offering some RV parking on site. Guests can book a spot any day of the season that they’re open! 75% of the open spaces are available at least 30 days in advance, while the remaining 25% is offered 72 hours in advance. They offer 27 40-foot spaces and 33 30-foot spaces. From what we can tell, rates start at $40 per night, although other factors affect pricing. In Eatonville, Washington lies Northwest Trek Wildlife Park. it’s a large 723-acre wildlife park that lets you get close to animals such as wolves, black bears, cougars, and more. 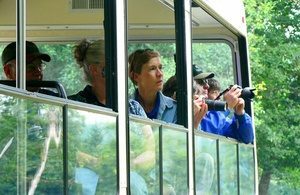 Their main feature is a tram that tour that takes you around 435 acres worth of their park. Northwest also offers a nature-inspired park for kids. Price: General admissions is $22.25 for adults, $20.25 for kids, and $10.25 for toddlers. Discounts are available for seniors. Mill Village RV Park in Eatonville is located just a few minutes from Northwest Trek Wildlife Park and other local sites, like Tahoma Woods, Elbe Ranger Station, and more. Unfortunately, they don’t seem to have their rates listed online, but they do have a four-star rating on Google reviews. This is the second-largest and most populous island of the San Juan Islands in Washington. It’s a beautiful vacation spot that almost makes you feel like there’s no such thing as work. The island was rated one of the top 10 best island in the United States by Tripadvisor in 2015 and one of the top 5 islands in the continental United States by Travel + Leisure. 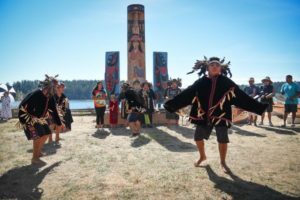 San Juan Island is rich with history as well. In 1895, the US and Great Britain almost went to war over possessions of the island. There are multiple places to stay with your RV on the island. Space is limited and there are only a few places with hook-ups available, but the convenience of being in San Juan with your RV is worth it. The only park we saw with rates available was the Fairground RV Campsites with rates starting at $35 per night. Washington is one of the most unique states in the entire country. There are very few places that offer all the different styles of attractions that it does. If you’re into metropolitans, technology, and science, Washington is a go-to place for that. Yet, if you like history and art, there’s something for you. Still, if you’re into nature, relaxing, or beach-style vacations, Washington offers great excursions for that as well. It’s no wonder The Evergreen State attracts millions of visitors each year – and it’s only becoming even more popular for RVers! Families large and small, old and young, all over the country are discovering what makes Washington so special. Happy Travels!